Embedded Buck/LDO regulator supporting on-the-fly selection. 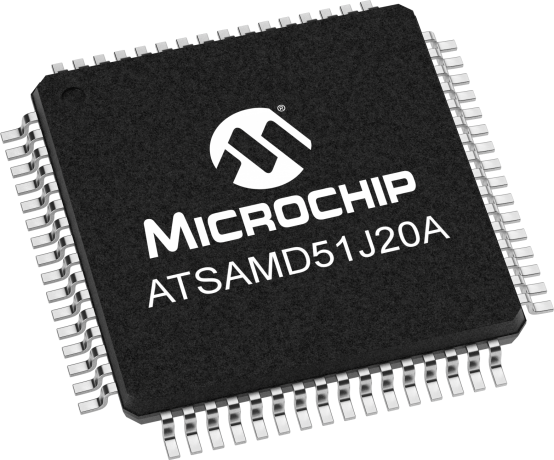 The SAM D51 high performance micro-controller series is targeted for general purpose applications using the 32-bit ARM® Cortex®-M4 processor with Floating Point Unit (FPU), running up to 120 MHz ,up to 1 MB Dual Panel Flash with ECC, and up to 256 KB of SRAM with ECC . Series offers excellent features with class leading power performance ideal for multiple market segments. · Quad Serial Peripheral Interface(QSPI) with Execute in Place (XIP) Support. · Peripheral Touch Controller (PTC) supporting up to 256 channels of capacitive touch . · Full speed USB with embedded Host/device. · Supports 5 Low power modes with class leading 65µA/MHz Active Power Performance. What is ICM? How to use it for Cryptography? This is an external Isolated debugger / programming interface for use with SAM M0+, M4 and M7 Microchip classic (square) styled motor control plug in modules for the MCHV-3 High voltage motor control development kit. It allows a safe, isolated debugger connection to a PC. It is not required with low voltage hardware. I/O1 Xplained Pro provides a light sensor, temperature sensor, and microSD card. It connects to the extension headers of any Xplained Pro Evaluation Kit. OLED1 Xplained Pro is an extension kit with a 128x32 OLED display, 3 LEDs and 3 push buttons. It connects to the extension headers of any Xplained Pro evaluation kit. PROTO1 Xplained Pro provides easy prototyping on the Xplained Pro platform. It connects to the extension headers of any Xplained Pro evaluation kit and can be used as a gateway to other Xplained Pro extension boards with its own Xplained Pro extension header. The SAM E54 Xplained Pro evaluation kit is a hardware platform for evaluating the ATSAME54P20A microcontroller (MCU). Supported by the Studio integrated development platform, the kit provides easy access to the features of the ATSAME54P20A and explains how to integrate the device into a custom design. Atmel-ICE is a powerful development tool for debugging and programming ARM® Cortex®-M based SAM and AVR microcontrollers with on-chip debug capability.